The article summarizes common additions are used for aluminum alloys, the engineering practice has acquired the following main addition methods for them, and recommendations, which should be kept in mind for selection of the master alloys and performing the aluminum alloy modification and grain refinement. Boron is added to precipitate transition metal impurities such as Ti and V and so improve electrical properties. It is mainly added as a dilute master alloy <1% B). Originally borax (Na2B4O7), or B2O3 was added to the electrolytic cell, or KBF4 was added to the melting furnace to tie up transition metal impurities such as vanadium and titanium which adversely affect electrical conductivity of aluminum. These procedures resulted in cell contamination, or generation of toxic fumes and residual spent salt (KAlF4) in the melting furnace. Bismuth is added both as the pure metal and as a dilute master alloy to enhance machinability of the aluminum alloys. Chromium prevents grain growth in Al-Mg alloys, inhibits recrystallization in Al-Mg-Si and Al-Mg-Zn alloys, and corrects for Fe to produce a golden color in anodizing. The main addition form is the concentrated tablet or briquette, although a significant quantity is also added as dilute master alloy. Copper is added mainly to increase strength, and it is added in many forms (pure metal, master alloys, concentrated tablets, and powder injection). Iron improves the high-temperature strength of some kinds of alloys. Addition forms are similar to that for copper. Magnesium provides high strength with good ductility, together with excellent corrosion resistance and weldability. For AI-Si alloys, it also improves heat treatment ability. It is mostly added as the pure metal, although master alloys are also widely used. Manganese improves strength and also plays a role in preventing recrystallization. The main technique of addition is as concentrated tablets or briquettes, powder injection, and, to a lesser extent, master alloys. Lead, like bismuth, is principally used to enhance machinability. The main method of addition is as the pure metal, although concentrated tablets and master alloys are also used. Silicon is used in "foundry alloys" (silumines) as it gives excellent fluidity in casting. It is also used in extrusion alloys, to which it contributes high mechanical properties. The main method of addition is as pure metal, but significant amounts are added as master alloys and through powder injection. 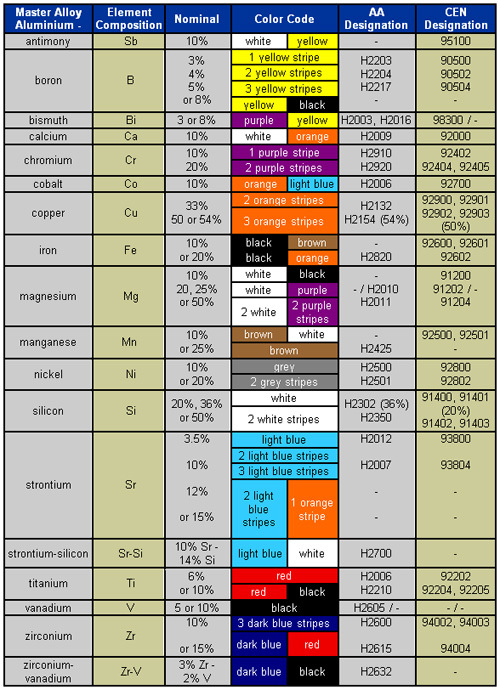 Strontium is added to modify the eutectic in Al-Si alloys. It is mostly added as a dilute master alloy. Titanium provides an important contribution to grain refinement. It is mainly added as tablets (including pure metal), but most often through master alloys. Zinc is used to improve strength. It is almost exclusively added as the pure metal. Zirconium is added to inhibit recrystallization. It is mainly added as a master alloy (up to 15% Zr), but also as a concentrated tablet. Tabele 1. Aluminium Master Alloys. Aluminum alloy history (processing, impurities, possible metallurgical heritage, charge composition, i.e. scrap content, etc.). Casting technology parameters (heating rate, overheating temperature, soaking time, pouring temperature, and soaking time at this point, crystallization rate at different parts of castings, etc.). The results of the microstructural, macrostructural, and physical investigation, that is are the alloy processing parameters optimal from the point of view of grain size, mechanical properties, foundry defects, etc. If not, can temperature and time programs be adjusted, and what will the result be in that case. The optimal amount of master alloy(s), introduction temperature and time, soaking, mixing, and pouring parameters have to be determined on the basis of target properties of castings. The formation of possible metastable phases and their influence on the morphology and microstructure of the final alloys should be taken into account. This requires more scientific effort to be applied to the problem before the operational window is set up for the casting process.